Sanity Check: Up to my ears in Easter Eggs! The up's and downs, the funny and not so funny's of having a family...and everything in between! Up to my ears in Easter Eggs! This year I was asked if I wanted to organize the Annual neighborhood HOA Easter Egg hunt and get paid for it! My answer.....heck yes. So, with 4 more days til the big event I have found myself buried in plastic Easter eggs! 1400 of them to be exact. It has taken me a week to fill them all with candy and toys. Needless to say, I'm sick of looking at them and trying to find a spot to hide them all! Oh and guess what I found? I found a hint of spring......FINALLY. 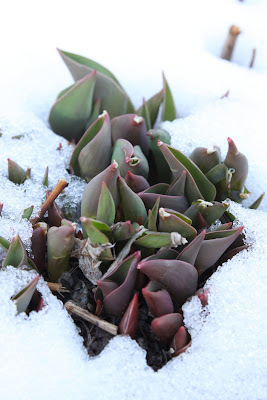 Yes, I found some of my Tulips peeking out through the snow yesterday and today (here comes even bigger news) we broke a record high temp!!! Yes folks, it was 78 degrees today and we all have sun burns. I will gladly take it after last weeks snow dump. Join in on Wordful Wednesday it fun! If not, head on over to Angie's blog Seven Clown Circus and see what all of the fuss is about. Wow, that is a LOT of eggs!!! That is A LOT of eggs. I can't wait to hear how it all turns out. And, I LOVE your new profile picture! Holy plastic eggs Batman! My toddler is very attached to her plastic eggs right now...those piles would be like nirvana to her!! Tulips must be really, really tough. How do they push through the hard, frozen ground and survive? Holy cow! That is a lot of eggs! I think my two year old would jump in them like a pile of leaves. Hope the weather is nice for your hunt!! wow, go you! that is a lot of eggs. But i think if I was getting paid for it I'd probably do it too! and YAY for spring, bring on the warm weather!! Whoa...and I thought I had a lot of eggs...and I only have about 50! Looks like a lot of fun though! Wow the most eggs I have ever done at home was 150 and that was a big deal! I hid them all over the house so it takes the better part of an hour to find them all. We do a different tradition on St. Pats you might enjoy with your kids. Keep Blogging. - W.C.C. Hope they pay well! That is a lot of eggs! Holy cow that's a lot of eggs!!! Have fun at the hunt! Hey those Tulips peeking out looks great. Crazy spring, no? Hope there is no snow for the hunt! You'd be finding eggs til May. Actually, that sounds like a very fun job. 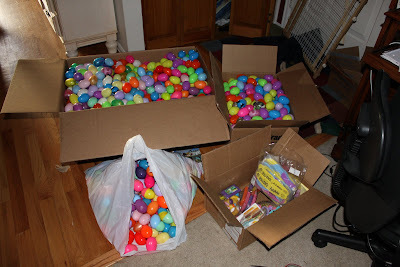 Thats a lot of eggs, but it kind of looks like fun! thats a whole lotta eggs,good luck in hiding them all! Where in the bloggysphere did you come from???? ?